Heard you missed me, now I’m back. Hey, folks! I’m back from Belgium, and let me tell you, I ate a LOT of frites. The deliciously fresh, thick-cut chips were available near-ubiquitously, and scarcely a day went by when we didn’t buy and top them with one of the dozens of inappropriately-named sauces offered by every purveyor. Our absolute favorite was samurai sauce, which actually offers very little to remind one of a Kurosawa epic. Instead, it was similar to a moderately spicy fry sauce (no surprise, then, that it was our favorite). There were plenty of other weird variations available, too. American sauce, for instance, seemed to have an orange peel and basil flavor – almost as if they had mixed A1, bottled Italian dressing, and mayo. Actually, it wasn’t really like that at all. Not one of my favorites, at any rate. There’s more to Belgian fast food than merely frites, though. 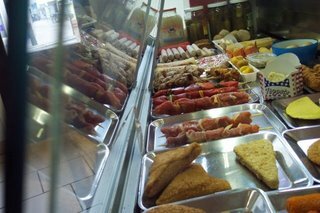 Nearly every friteur offered an additional range of meat, chicken, potato, and cheese products in deep-fryable form. Yes, indeed: everything in the picture above could be yours, but it, like the frites, will almost certainly be cooked in hot oil. A dieter’s paradise, Belgium isn’t. The picture, ably taken by my girlfriend at my favorite friteur of the trip (in Antwerp, at the five-way intersection involving Lange Koepoortstraat and Minderbroedersrui), offers a view of the various delights. We didn’t sample all of them (they seemed to fall into categories of similarity based on ingredients, much like Taco Bell), but my favorite invention by far was a chicken nugget on a popsicle stick shaped like a chicken bone. I suppose it’s for kids, but it seems like the kind of thing that could make McDonald’s a fortune. Other meals of note included a Congolese dinner in Brussels that offered one of the hottest hot sauces we’d ever tried, an Indonesian dinner that was both inexpensive and delicious, and, at a place called Tom’s Diner (in Bruges) that isn’t anything close to a diner, we had amazing pasta and meatloaf in a presentation and setting that would satisfy hip New Yorkers AND your grandmother. Normal coverage to resume very soon. Thanks for your patience!